It definitely says something about the zeitgeist when even the glossies are getting all existentialist on you, but such is the case with Vanity Fair UK, who are co-sponsoring a Digital Summit today with pundit-mongers Intelligence Squared. The main panel topic is “Are Humans Engineering Our Own Obsolescence?” Jeremy Paxman apparently has thoughts on this. Follow #VFintelligence on Twitter to learn what they are. Martin Ford — whose polemic The Rise of the Robots came out in May — has an op-ed in the Times pointing out that while the robots may be coming for our jobs, they’re also coming for Chinese jobs. Swings and roundabouts, eh? 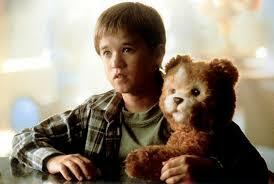 Remember that mildly creepy robot bear from the Spielberg movie A.I.? Yeah, this guy. So does the MIT Media Lab, it turns out. Check out The Huggable, a new therapy bear being developed by a team at the Personal Robots Group. Or if you just want to cut to the chase and watch a half-fur, half-metal cyborg rasp wheezingly about coloring books, check out this video embedded below. In addition to being the most addictive past time to hit third grade since Yu-Gi-Oh, Minecraft, it turns out, may hold some of the secrets to making robots smarter. Next Next post: Note 1: If this is a revolution, what kind of revolution is it?